The supported arithmetic operations are negation (sign change), addition, subtraction, multiplication, division, and taking division remainder. The supported operand sizes are byte, word (2 bytes), double word (4 bytes), and quad word (8 bytes). The actual size of the block is rounded according to the operand size, for example, if the size of the selected block is 11 bytes, and the selected operand size is 4 bytes (double word), then only 8 bytes will be processed, and the last 3 bytes will remain unchanged. The second operand may be specified as immediate hex values, or as immediate decimal values. A clipboard contents can also be used as a second operand. If the second operand is shorter than the selected block (stream), it will be used repetitively. 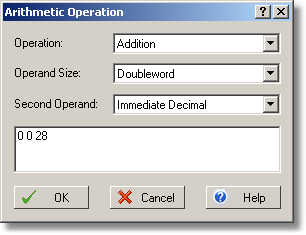 The example operation shown on the screenshot above will add decimal value 28 to every third double word. Note that the negation (sign change) operation does not require a second operand.